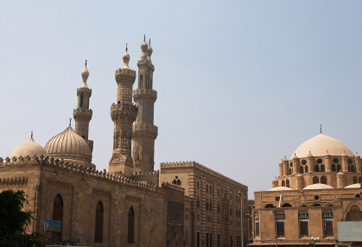 Cairo, in Egypt, houses one of the oldest mosques and universities. Al-Azhar Mosque and University is now the foremost Sunni institution in the world. Al-Azhar mosque was the first in Cairo, the capitol of the Fatimid Caliphate. The university followed and became the second oldest continuously running academic institution after Al-Qarawiyyin. Al-Azhar, part of a series on important sites in Islam, is the focus of this post. Al-Azhar Mosque was commissioned by the Al-Mu’zz li-Din Allah in 970 C.E. The name “azhar” is the masculine form of “zahra” which means “most resplendent” and was a nickname given to Fatima, the daughter of the Prophet Muhammad. The mosque was suppose to be a base to spread Ismaili Shia Islam. Thus, Al-Azhar began as a Shia institution. After Salah ud-Din (known as Saladin the West) overthrew the Fatimids in 1171 C.E., he was hostile to the Shia leanings of the Al-Azhar and for a period of time Al-Azhar lost some of its prestige. However, during the Mamluk Sultanate which followed Salah ud-Din and his Ayyubid Dynasty, Al-Azhar regained its position and became a center for Sunni thought. The mosque eventually became a university in 989. From the beginning, Al-Azhar was considered a center of learning and a place where official pronouncements were issued. At Al-Azhar University, students could study Qur’an, hadith, Islamic law, theology, and Arabic. In 1961 the university was nationalized and officially designated as an independent university. Also in 1961, the functions of the university and the mosque were separated and secular departments were created in the university. Now, in addition to religious studies, students can study subjects like medicine, engineering, and economics. Al-Azhar University now also runs primary and secondary schools. Throughout its long history–over a millennium–attitudes towards Al-Azhar have changed, but overall it has remained an important symbol of Sunni Islam. Al-Azhar Mosque and University are both influential institutions not only for Egyptians, but for Muslims around the world. Have you visited Al-Azhar University or Mosque? What was your experience? Why do you think Al-Azhar is important? How do you think institutions like Al-Azhar influenced other universities? Please share your comments below. This entry was posted in Beliefs and Practices, Prophet Muhammad and tagged #SSRCWCG, Al-Azhar, Egypt, Important sites, University of Al-Qarawiyyin by Reem. Bookmark the permalink.